Travel back in time on a genuine steam train from yesteryear ! From Paimpol to Pontrieux, rediscover the charm of old-world travel ! Rediscover the charm of old-world travel on board the Trieux steam train. 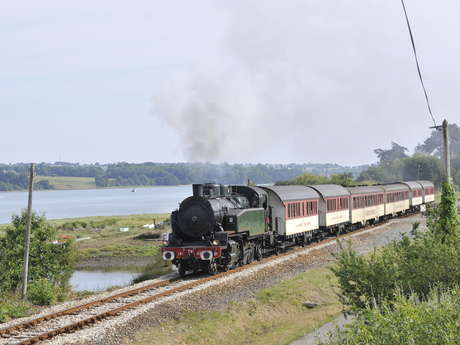 Classed as a historical monument, the locomotive takes you on one of the most idyllic rural train lines in France, along the Trieux estuary. The exclusive 30-minute stop at the Maison de l’Estuaire enables you to get to the heart of maritime Trieux in the protected site of Penhoat-Lancerf, one of the largest coastal forests in Brittany ! Arriving in Pontrieux, a ‘little Breton town of character’, awarded 4 stars by France in bloom, famous for its fountain, its Eiffel Tower and its 50 lavoirs or washhouses that you can discover during a boat trip along the river. A history of the succession of locomotives used on the line since 1997. The first trial run took place in August 1997 during the weekend of the Sea Shanty Festival in Paimpol, and was a great success. Today, the locomotive is classed as a historical monument. The 141 TB 424 belongs to the series 4401 - 4512 of the Chemins de fer de l’Est network, which were constructed from 1911 to 1917. These locomotives were capable of travelling in both directions at a speed of 90 kilometres per hour. During the Great War, the 4400s were used to supply troops at the front, most notably during the battle of Verdun. The Breton rail network first saw light of day in 1879, thanks to the state-led ‘plan Freycinet’. Its objective was to develop local rail networks in order to improve transport links around the country. During the 1960s the rail network’s finances declined, and road transport started to develop.